Our Corporate Fun Cycling Session is a casual teambuilding session that allows your team to bond through a casual Fun Cycling Session. Depending on how intensive you would like your teambuilding session to be, we will be able to recommend the ideal route for you. Our routes varies from a scenic ride through the Green Corridor of Bukit Timah Railway track to a historical ride through Changi Road’s World War 2 memorials. Share with us your teambuilding objectives and we will deliver the best program for you. “An opportunity for the team to get together since we often work offsite. It was wonderful seeing colleagues chatting along the leisure ride and encouragements for those who needed it. We completed it and we are so proud of the achievement. 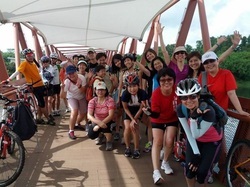 Biking Singapore, thank you so very much!"